Just hearing the words, long weekend, is more than enough to make me the happiest. Who doesn't want weekends? All the more if it meant extended weekend vacays. This rarely happens so when faced with holidays trapped on Thursdays or Tuesdays, I make it a point to consume my vacation leave credits. 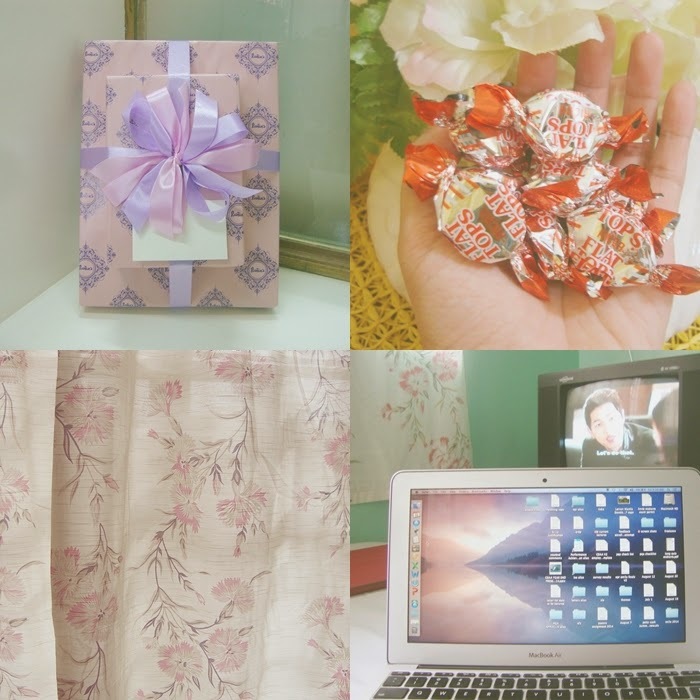 Before this rare long weekend ends, let me recount the few beautiful things that made my week. Rustan's Gift Wrapping Services - Premium price that equates to premium service. I lately discovered that some items sold in Rustan's are actually cheaper in SM. However, I sometimes prefer to purchase these items from Rustan's. Premium gift wrapping services and excellent customer service make me favor the little additional price from Rustan's. I don't mind paying a little extra for services that exceed my expectations. Curtains to block the sunlight because I'm about to sleep while everyone is about to start their day - I'm unfortunately or fortunately turning nocturnal? My brain seems to love the working environment from night time till dawn. About to end work in the company of a Korean drama series - Hi Kang Maru! ;) I'm finally done with Innocent Man. 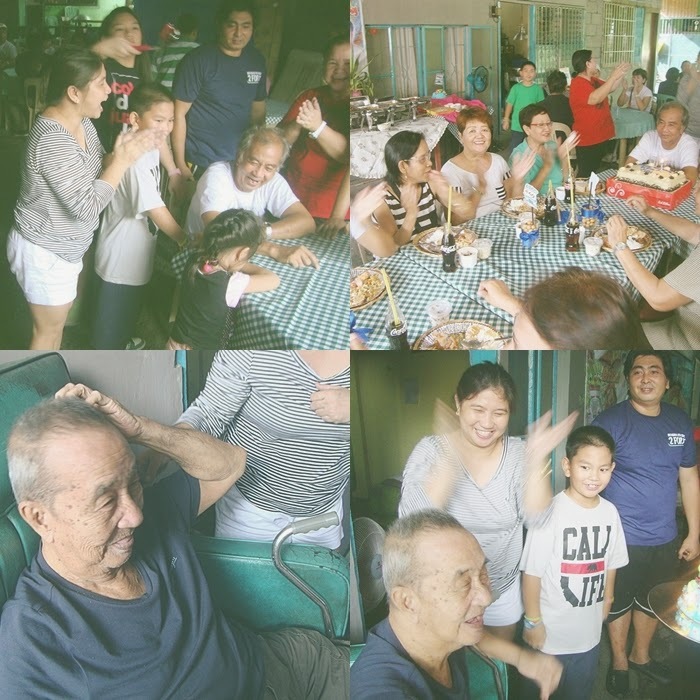 Snapshots from a recent family reunion prompted by Uncle O's birthday! My cousins might hate me but I almost didn't attend this rare family gathering. I then remembered an advice given by a former freelance client. She reminded me to prioritize time with family, friends and social life than work. Work will forever be around. Friends, family and my life will gradually be taken away and the moment I realize it... it might be too late to regret. And before I end this post, I'd like to thank Theresa for passing me this Sunshine Blogger Award! In response to this award, here are my responses to Theresa's challenge. 1. Who is my favorite author? Kim asked me this question a few weeks ago. Following my mood and memory, I would say Cecelia Ahern, John Green, David Levithan and Khaled Hosseini. 2. When did you know you're going to be a blogger? I can't really remember but I started a blog back in 2005. I even opened other blogs from different platforms. All of these blogs faded away and I regained my interest in blogging in 2010. Undercover Boss. I hope it will be franchised in the Philippines too. The show captures my heart because I can always relate to the sentiments of the hardworking and honest rank and file employees. I'm limited to English and Filipino. 5. What is something you're looking forward to? The shallowest would be long weekends!!! Haha Seriously, travel opportunities, career advancement and currently, the success of my documentation project. 6. What's your favorite time of the year? December!! It's Christmas and my birthday. The festive and happy environment never fails to excite me. I went to Palawan almost two years ago and I was mesmerized with the entire experience. Palawan is my current definition of paradise. Tagaytay - Truth to be told my few trips to Tagaytay were limited to short visits. Despite the short stay, I fell in love with the place. The scenery, colder temperature, restaurants and the retreat house form my definition of vacation. Taiwan - My first trip abroad on my own! I had great memories in Tainan from people to that one great endeavor I accomplished. 8. What's your favorite "me time" activity to do? 9. What store does your shopping trips always include? Juana's Clothing - My favorite shop in Divisoria!! When budget permits or if I'm limited to window shopping, I visit Mango, Gap or Zara. 11. What's the most expensive thing you bought for yourself? The first laptop I had, way back 2005. Ahhhh... good for you. I opted to work during the holidays this month for the holiday pay. Sayang din coz I can use it for our Dumaguete trip next month. Hehe!